Olympians eat, just like you and me. And those who train in the South Bay have favorite foods ranging from Vietnamese beef noodle soup to chocolate bars. But given the demands they place on performance, we know they have to pay close attention to what they eat. Back when they still had time to talk, we asked a handful of world-class athletes about their diets and how they prepare for competition, whether the Olympic trials or the Games themselves, which begin Aug. 13. Three are going on to the Games in Athens; three didn't make it into the top three spots needed to qualify. . The runners didn't make it. We picked sports -- table tennis, running and swimming -- that ordinary people do. Each Olympic hopeful has her or his own way. It turns out there is no magic diet, except for this: Nobody counts calories. They eat a balanced diet that includes protein, fruits and vegetables, and yes, carbs. They follow many of the rules your mother probably told you when you were growing up. But they just do it. Nguyen is a software engineer at Neoforma in San Jose and lives near his favorite beef noodle soup restaurant, Pho Kim Long on Capitol Avenue. Next month, he will be competing in his second Olympics. Nguyen was born in Nha Trang, Vietnam. His family fled Vietnam in 1976. Now he hopes to win the United States' first medal in table tennis. Nguyen skips breakfast and goes directly to the gym for weight training or aerobics early in the morning. Afterward, he'll have fruit. He likes bananas and watermelon and finds them easy to digest. Lunch is usually a noodle or rice dish. He avoids fast foods such as pizza or burgers and anything fried. And, like most athletes, he does watch when he eats. ``I have to eat at least an hour before training,'' he says. Afternoon practice involves sprints, lower-body squats, and working on his serve and return. He does footwork drills with his coach, who machine-hits balls at him. For dinner, a Vietnamese caterer brings soup, salad and a main dish to his house every day. During competitions held around the world, he can't control his meals as well. ``The day before, I eat light. The day of, I may just have Power Bars all day.'' He drinks water and, sometimes, Gatorade. The big meal of the day comes after competition. He also loves sushi. ``I just have to stay away from ice cream,'' Nguyen says. Twin synchronized swimmers Bianca and Sonja van der Velden train with the Santa Clara Aquamaids, based at the Santa Clara International Swim Center, from September through April. They won team and duet gold medals at the U.S. National Synchronized Swimming Championships this year with the Aquamaids, and Bianca took third place in solo swimming. During the past three summers they have trained at the Independence High School Fiscalini Aquatic Center. The van der Veldens are closely supervised in the water and at the table by their coach, Nathalie Bartleson, an Olympian at the '96 games in Atlanta. Bartleson, a fitness instructor and personal trainer in San Jose, is accompanying the twins to Athens. They are competing for the Netherlands. When she became their coach, the basic changes she made in their diet was to have them eat a little throughout the day, often a hard-boiled egg or a chicken breast. ``The problem is, hunger isn't a good indicator (for an athlete),'' Bartleson says. Besides, if the twins wait till they're hungry, they crave chocolate. Which Bartleson says is OK within reason, but never after 6 p.m. She tries to keep the rules reasonable. 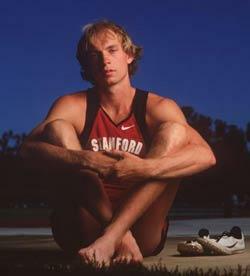 Stanford graduate and 2000 Olympian Michael Stember would like to open a restaurant when he's done running. That's how much he loves to talk about food. ``The same things apply whether you're trying to lose 10 pounds or get in general shape,'' said Stember in late spring, just after taping a cooking show for NBC. A few of his favorite things: Eat often instead of having huge meals. Get some color on your plate -- and not just red peppers. Go for variety. ``There are toxins in every food, so mix it around.'' Spinach one day, chard the next. To avoid this, his kitchen is ready to go at all times. Stember, who runs 75 miles a week, has a system. He shops on Sundays, making a sweep of Mountain View from the Milk Pail to Trader Joe's to Costco. He cuts everything that can be cut (broccoli, cabbage), then cooks lentils, brown rice and sweet yellow potatoes (not yams). Flank steak or salmon marinate. Dessert is always fruit. On Thursday, he shops again. Stember learned to make the cupboard stretch from his mother, who fed six children. And he remembers how everyone responded when he made quesadillas for a sixth-grade class project. If all this sounds impossibly virtuous, keep in mind that Stember's flank steak isn't the size of a deck of cards, and dessert is more than one plum. He figures he eats about twice as much as any non-athlete. Tall and lean, Nike Farm Team member Neugebauer cooks for himself. Breakfast is whole-grain oatmeal with cooked egg whites, a grapefruit or an orange and black tea. Lunch often is a skinless chicken breast on whole-wheat bread, accompanied by steamed vegetables and a mixed green salad. At 3 p.m., an hour before practice, he has half a bagel with peanut butter. After practice, another shake, often made of Opti-Pro protein powder. Dinner often is pasta, lean meat and a vegetable. For dessert, fruit and yogurt. ``I can't keep weight on,'' says Chantee Earl before practice at Stanford with Frank Gagliano. Her sharp cheekbones confirm it. She has given up coffee. Now she has cereal or waffles with fruit and juice for breakfast. Lunch is a turkey or tuna sandwich with fruit and water. Earl is not a snacker: ``I'm pretty good at waiting for dinner.'' But she drinks a lot of water, four or five 12-ounce bottles a day, and after practice she gets extra carbohydrates from Accelerate and R4 drinks. For dinner, she often slaps beef or chicken on her George Foreman grill and eats that with rice and a vegetable. Among 27 starters, Earl finished in sixth place at the Olympic track-and-field trials.